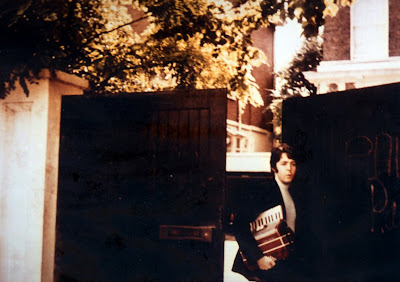 I told you about the Norwegian music magazine "Tunes" back in December, and the fan photo that Egil Gjerde had taken of Paul leaving his house in Cavendish Avenue, carrying an accordion. Our friendly neighbourhood blog, "Meet The Beatles for Real" has been sent another photo from the same occasion (above). See my earlier post for discussions about Rocky Raccoon and this accordion. There's another story from "Tunes" that I found interesting. It concerns a young Norwegian girl, Aina Romø from Kristiansand, very likely the only Norwegian to have been present at the recording session for a Beatles song. In 1967 she was a 19 year old girl, working as a DJ at Raffles, King's Road in Chelsea, London. She was also Mike Pinder's (The Moody Blues) girlfriend. and befriended Paul McCartney at the Bag O' Nails club. In September 1967 she and her boyfriend attended a Beatles session in Abbey Road for the recording of "Blue Jay Way" for the Magical Mystery Tour soundtrack. The records show that the sessions for this song occurred at the 6th and 7th of September. What's interesting is that Aina remembers that Yoko Ono also was present. This must have been around the time when the other Beatles were referring to Yoko as John's "flavour of the month". Aina recalls that John and Yoko were sitting around, doodling on drawings and lyrics sheets, not paying much attention to what the rest of the Beatles were doing. "Yoko Ono was nice, but I thought she was a bit strange. She had probably been smoking something or other! I was sitting at the same table as her and we were talking, but I don't recall about what. She was dressed in white from top to bottom. John must have seen something valuable in her that no one else could see. What instruments The Beatles were playing on "Blue Jay Way", I'm afraid I can't remember. If I could have lived through it again, I would have paid more attention. In the kitchen I remember Ringo Starr rolling a joint. They thought George Martin didn't notice, but I think he had some idea about what was going on. When the song was finished around three in the middle of the night, there were lots of fans waiting patiently outside to get a glimpse of their idols. Several asked who the young lady was and Paul explained to them: "She's my little sister", probably a joke to end the speculations. We took a taxi to the Bag O'Nails, where Paul bought drinks for all. John and Yoko had remained in the sudio, tinkering at the grand piano, while the rest of us went partying. Later Paul came along with us for an after party at Mike's (Pinder)."